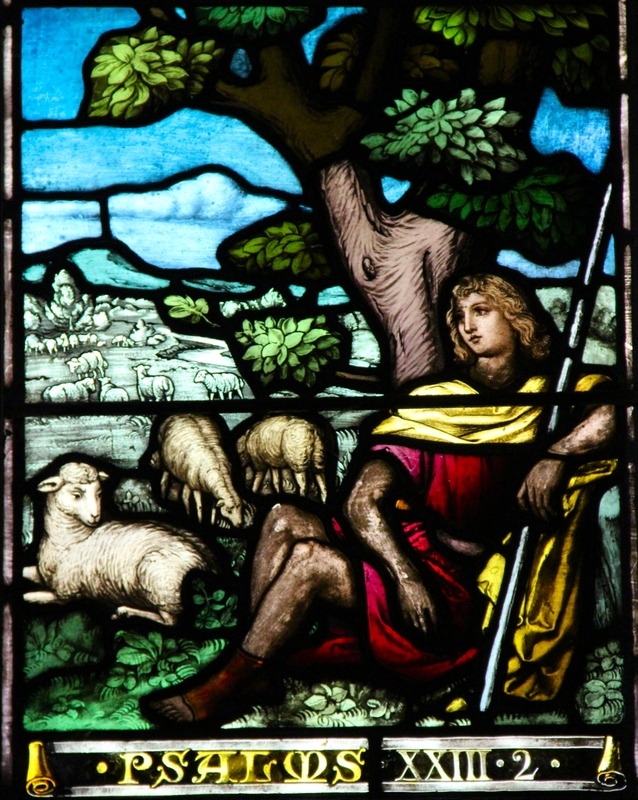 The main metaphors in the Psalm are the Shepherd and the sheep. It doesn’t take much thought to realize that we human beings are the sheep. But who was the Psalmist referring to as the Shepherd? Christians would think of Jesus as being the Lord. But this Psalm was written a long time before Jesus. This is not to depreciate or detract from Jesus. If the writer was David, he never knew Jesus. But he knew some One. He knew some One that he had absolute trust in, some One he believed in implicitly. That some One he called the Lord. 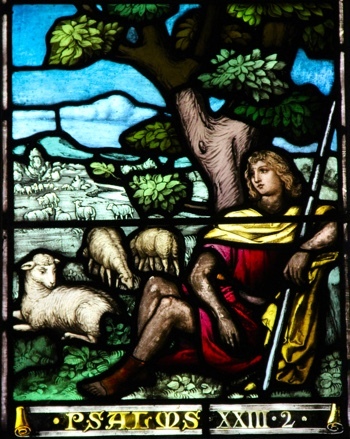 He was acknowledging the Lord to be his Shepherd and implying that he was a sheep. The statement, “The Lord is my Shepherd, I shall not want,” is quite a powerful statement to make. I will assume that it was Dvaid who made it and when we consider the lot of the shepherd as he looked out over the barren landscape and wondered what his life would be like in the future, it didn’t seem very promising. Nevertheless he had faith in this Lord that he had discovered within him and he was trusting the Lord to take care of him in every way. David was often alone and probably bored watching after the sheep. It was a lonely existence and he probably wondered as so many wonder today, if anything good will ever happen in his life. But things can change quite suddenly and they can do so when we least expect them. This happened in David’s life. One day the same Lord that spoke to David spoke to Samuel and told Samuel to go to Jesse’s house to select one of his sons to be the new king of Israel. The Lord said that Saul was going to be replaced. So Samuel went to see Jesse. Seven of his sons were brought before Samuel to be inspected for the role of king. After seeing the seven sons Samuel was told that none of them was to be selected. Samuel asked Jesse if he had any more sons. Jesse acknowledged that he had one more, a young one who was out in the fields taking care of the sheep. The brothers must have been very disappointed when Samuel did not select one of them to be the future king. Jesse and the seven sons thought that surely Samuel would be looking for someone older than David. But when David was brought before Samuel, the Lord spoke to Samuel and said, “Arise, anoint him, for this is he.” (I Sam. 16:12) So David went from a barren life in the desert as a shepherd boy to future king of Israel. That was quite a change in his life. It would never be the same again and it would never be boring again. We can never be sure when that moment will happen in our own lives. For some it may not happen. But for those who have the faith of a David and can say, “The Lord is my Shepherd, I shall not want,” something wonderful will happen as they stand firm in their faith and expectancy. Why did the Lord select David over his seven brothers? The Lord knew the condition of David’s mind and heart. He knew David as He knows all of us. He knew David had the qualities of mind and heart that were necessary to be a king of Israel. The Lord doesn’t just consider the outer appearance. It makes no difference what we look like or how much money we have or how beautiful a person may be physically. The important thing is the condition of the soul. The inner qualities of faith, trust, honesty, sincerity, courage, and the many other spiritual qualities that we are seeking to develop, these are the things that the Lord needs in order to use us to do His good works. It may be that the things the brothers probably forced upon their younger brother were the very things that helped develop in David the qualities needed for him to be prepared for the role of king. We ought to keep this in mind when we are tempted to try to get out of something challenging or difficult. It might be that that very thing is what we need to develop the David type of faith and trust in the Lord. The more faith in the Lord that we have the less personal manipulation will be needed. When we have faith in the Lord we won’t have to search around for metaphysical formulas or secret esoteric teachings which we think will make us a fortune or change our lives dramatically in some outer way. The only thing that will do that is faith and trust in the Lord. For David, the Lord wasn’t Jesus and it wasn’t Abraham or Moses or Samuel or Isaiah. The Lord was the Spiritual Presence that spoke to David, Samuel, Moses, Abraham, Jesus and many of the other Biblical characters. The same Lord, the same Spiritual Presence, is still speaking through many today. The Lord speaks to those who have the David trust. He speaks to those who can affirm and mean it, “The Lord is my Shepherd, I shall not want.” It may look like a need is not being filled but a David would still wait, stand firm, and trust the Lord. In his lifetime David got himself into quite a few predicaments. His stating, “I shall not want” did not mean he never had any challenge to meet. It means that no matter what came up in his life, he always looked to the Lord for guidance and help. He knew that with the Lord there was always an answer to every need. David continues to affirm his faith in the Lord and how the Lord helped him. He states, “He maketh me to lie down in green pastures.” The imagery is one of opulence. God’s supply is not limited by human economics. God’s supply is unlimited. Even if we seem to be in a desert type of experience, God’s love can and will provide for our needs if we will only look to him and trust Him. It is interesting to note the fact that he says “lying down” in green pastures. This would give the meaning of comfort. It would be much more comfortable on the green grass than on the rocky barren ground. When one has an absolute trust in the Lord, he can be comfortable with his or her life. One does not have to worry about present needs or future ones for he knows that the Lord can and will provide. It doesn’t mean that he is lazy and unwilling to work. It simply means that he will do what the Lord tells him to do instead of doing what he personally thinks will make him prosperous. The Shepherd knew where the green pastures were and led the sheep to them. Our inner Lord knows where our green pastures are and if we will let Him, He will lead us to them. David also affirms, “He leadeth me beside the still waters. He restoreth my soul.” I have heard many versions about sheep and the still waters. Someone has said that because of the structure of their nose, sheep cannot drink from turbulent waters. Also that sheep have an instinctive fear of fast-moving waters because of their wool. If they got wet the stream would wash them away. Then there is the other one that the shepherd knew where the wells and springs were and would lead the sheep to them and draw out the water and put it into a trough for the sheep to drink from the trough. One idea that is implied and should be helpful is that even when we are fearful of some experience, the Lord will help us meet it on our level. When the soul is in need of restoration, the Lord is there to give us new inspiration. When we feel empty inside, when we do not seem to know what to do, when we may be discouraged because things do not seem to be working out, we can turn to the inner Lord and He will restore our soul. He will give us a new vision about our lives. Sadness will be turned into joy. Discouragement will be turned into enthusiasm. Despair will be turned into hope and expectancy. Soul restoration relieves us of guilt. It inspires us with a spiritual faith, a faith not only in the Lord but a new faith in ourselves and our possibilities. “He leadeth me in the paths of righteousness for his name’s sake.” You are God’s namesake. Everyone is God’s namesake. When we let Him, He will lead us in following and applying principle in our lives. Righteousness can be interpreted to mean the right use or application of principle. Scientists know that if they are to be successful in orbiting the earth that they must follow the physical laws of the universe. They spend many years in school learning about these laws. They are very meticulous and obedient to them. They do not compromise one bit. Spiritual law is just as eternal and unchanging. We should realize that if we want to be happy, healthy, and prosperous we have to be obedient to the laws of the universe. We cannot violate them with impunity. The Lord will teach us how to live harmoniously and joyously and successfully. Even though we may sometimes have to walk through the great shadow of the unknown, the Lord will be with us. David expresses this comforting thought in this way. “Yea, though I walk through the valley of the shadow of death, I will fear no evil.” It is his way of saying, “I will not be afraid of the future or an unknown experience for I know the Lord is with me to protect me and to guide me.” The sheep had good reason to be fearful of the canyons and crevices where snakes or other wild beasts were ready to attack them. But as long as the shepherd was there, the sheep were confident or at least felt secure and they would follow the shepherd. As we go through life we never know what we will have to meet. The future may seem like a great big unknown shadow, but we can go forward to meet it when we trust in the Lord. We can know as David expresses in the Psalm, “Thy rod and thy staff, they comfort me.” This simply means that he is affirming faith and trust in the Lord to protect him. It is as if David were saying, “I know, Lord, that you are greater and more powerful than anyone or anything I have to meet. Therefore^I can go and meet every experience with courage and confidence. If I get myself in trouble, you are there to anoint my head with the oil of your love.” When the shepherd brought the sheep in to be put in the fold, he would inspect them. If they were injured he would anoint their wounds with oil. He would not rebuke them for getting injured, he just anointed them. The Lord does not rebuke us for getting injured in life’s experiences. His love is there to comfort and heal us. When we make mistakes unintentionally or even willfully, the oil of His love is there to comfort and help. At this point in the Psalm, David uses the metaphors of the host and the guest, the host who prepares a banquet and invites his friends to come and join him in the festivities. When the guests arrive, the host provides sweet smelling ointments. You will recall Jesus’ reference to this in the story about the woman who washed his feet with her tears and dried them with her hair. Jesus rebuked the host, saying that he did not provide water to wash his feet or ointments when he arrived. The imagery is again one of abundance. Sometimes we get so focused on what is against us and who is against us that we do not see the prepared table that is before us; we do not see the solutions or the ideas that the Lord has prepared in abundance for us. David concludes this beautiful Psalm with the words, “And I will dwell in the house of the Lord forever.” This means that he will abide in the consciousness of the Presence of God, the Lord. No matter what experiences come up, both challenging and joyous, he will never forget that the Lord is his shepherd. He will keep working to rebuild the consciousness of the inner presence, a consciousness of truth and a spiritual, immortal body. As Paul expressed it, “The mortal must put on immortality.” The “house of the Lord” is your body temple. As we improve our thoughts and beliefs about the body, the temple will be renewed and eventually it will be an eternal, indestructible temple not made with hands.